Effective January 1, 2016, all Remington firearms come with a lifetime written warranty. The tested firearm is Remington #84273, the “Mountain Model 700 SS,” which weighs about 6-1/2 lbs. I weighed my example, unloaded and unscoped, at 6 lbs. 9 ounces. The grand appeal of this Model 700 is its light weight and low maintenance. It sheds anywhere from half of a pound to a full pound off of the weight of most long action bolt-action rifles. The Weatherby Vanguard Series 2 Sporter hits 7-1/2 pounds, for example, while similarly configured Weatherby “Back Country” does hit 6-3/4 lbs. The Weatherby Back Country also hits $1429 of retail price. Remington did a lot of things right with this model. The Bell & Carlson stock, though not overly “grippy,” isn't slippery either. The soft recoil pad is perfectly fitted and the stock has a very nice Monte Carlo cheekpiece that lines your eye up quickly with the scope. There are no iron sights. 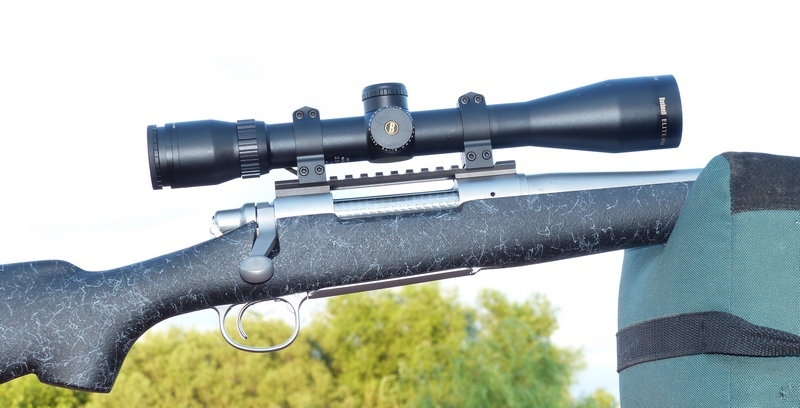 The 700 Mountain Rifle SS has a stainless steel action, barrel, and floorplate. The two-position thumb safety works quite smoothly, as does the bolt itself. The bolt is attractively jeweled and the 22 inch barrel has a recessed target crown. This Remington is equipped with the latest X-Mark Pro trigger which is easily, externally adjustable. It has no take-up whatsoever, it just breaks, and so is a noticeable improvement over previous Remington triggers. As supplied, it broke at a heavy 5-1/4 lbs., but it took only moments to lighten it to a more suitable hunting weight of 4 lbs. Three to five pounds is the advertised adjustment range. It is the best trigger I've tested on a factory Remington, for there is zero take-up, zero creep, and zero grit. There is a glut of bolt-action rifles on the market. The 700 Mountain Rifle SS is a welcome departure from the plastic trigger guard, plastic trigger, plastic floorplate, or plastic protruding detachable box magazines that come in varying degrees of unsightliness and all too often disrupt or destroy the lines of what once had the potential to become an attractive rifle. I mounted a Warne steel Maxima one-piece rail, Warne #M674M, “Remington Long Action Tactical Rail Matte. It is a solid steel rail: I mounted the standard, 0 MOA base, but it is available in a 20 MOA version as well. Warne has new 7075/T6 aluminum alloy “Mountain Tech” bases going into production very soon, a good choice for saving a few ounces in keeping with the “Mountain Rifle” theme, but for the time being I stuck with old reliable (steel) on the basis of availability. I mounted a Bushnell Elite 6500 2.5 – 16 x 42mm riflescope just to test the rifle, but its 17.3 oz. weight and bulk isn't ideal for a lightweight hunting rifle, as there are several more appropriate scopes that shave ¼ lb. or more off of the Elite 6500. The initial firing came at the end of a long day testing numerous other firearms. For starters, I fired a three-shot set of Hornady SuperFormance 130 grain GMX 3190 fps rounds. The results were surprising, as in surprisingly dismal. It wasn't what I could call a group, it was an 8-1/2 inch pattern. Next, I used a very similar round, the Hornady Full Boar GMX .270 cartridges that are rated at 3050 fps with a 24 inch test barrel. Same brand of ammo, same excellent GMX bullet, but the Remington 700 SS Mountain Rifle shot right at one inch with the Full Boar loads. It goes to show that an ammunition change, even an ostensibly minor one, can make all the difference in the world. This Remington 700 Mountain Rifle is an excellent product, with a superb trigger and very positive ejection. And, Hornady makes some outstandingly good loaded ammunition. Still, it is the specific combination of the two that can make an astounding difference.